The Plagueground is one of the trails in the RAT-Ridgway Area Trails System north of Ridgway, Colorado. The trail begins off of the Double Crosser trail near the point where Ratical comes to an end and runs for almost 2 miles down to an old access road. 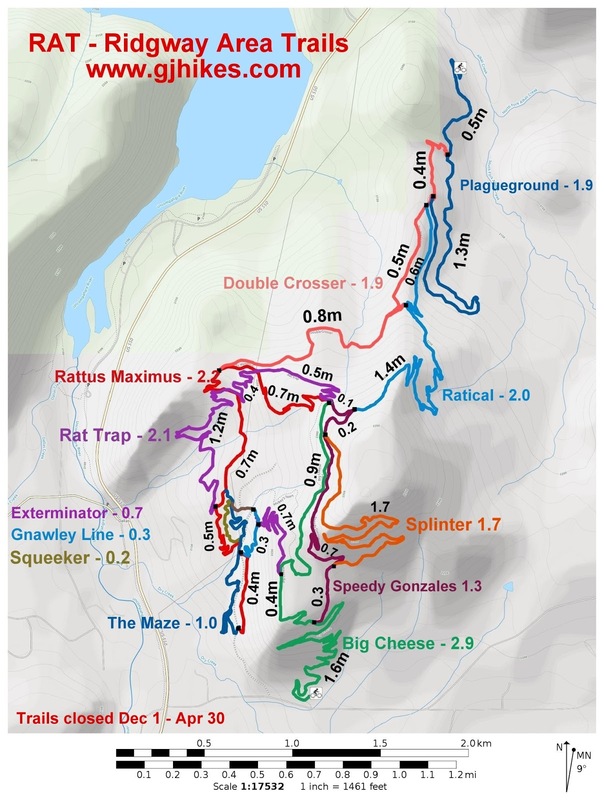 There are a few mountain bike trail systems that incorporate an area called a 'playground' but since we are dealing with a rat theme here a play on words turns 'play' into 'plague'. If you are expecting an open riding area like some playgrounds have there isn't one. The intent was probably to just have fun with the name. The upper end of the trail starts at the 0.4 mile point of Double Crosser measuring from its northern end. The trail starts out heading south along a good singletrack. As the trees thin out you can see more of the trail ahead. The trail is heading gently downhill so if you feel a need for speed you can crank it up. There are a few dips and shallow washes to blast through. The trees give way to sagebrush as the trail travels out in the open and turns back toward the north. Around the one mile point the trail once again enters the trees. At the 1.3 mile point Plagueground reaches the start of the Double Crosser trail which branches off on the left. From there the trail continues its course through the trees. Views of Cimarron Ridge make up the horizon to the east as the trail continues around the hillside toward its finish. The trail makes one last switchback before coming to an end at a road. Across the road is another trail that was currently under construction at the time we took the photos for this post. It is unclear whether there are plans to make a trailhead and parking area here but it looks like it would be a good place for one. At present the only choice once reaching this spot is to turn around and head back the other way. 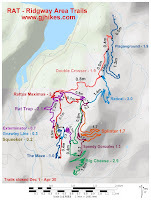 We retraced the last half mile of the Plagueground trail and rode Double Crosser next. If you would like to see it for yourself then all you have to do is grab your bike or 'Take a hike'. NOTE: All trails are closed between December 1 to April 30.